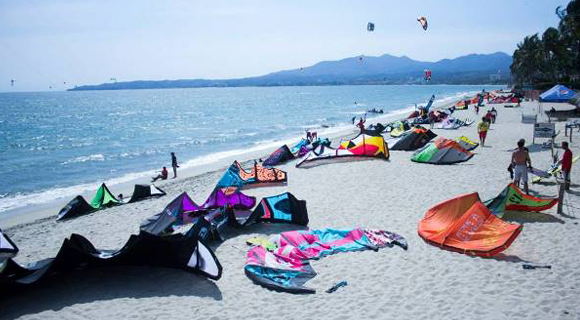 One of two top spots in Mexico for Kitesurfing; the northern area of Banderas Bay has six climate-monitoring systems. The adventure begins in the coastal villages of the Riviera Nayarit and Bucerías—the town of scuba divers—is first on the list. Known as the Wind Capital, it very appropriately hosts the Wind Festival, the number-one international Kitesurf competition in Mexico that takes place every May. This is a perfect spot for Jetsurfing as well, so it’s home to Mexico’s second shop/school. Every year, Bucerías celebrates the end of Holy Week and Easter with the Oyster Festival, where they gift thousands of oysters to the community. The record for the biggest oyster was set in 2014, with a mollusk that was a full 8.7 inches in diameter. January 24th marks the Marine Pilgrimage, a unique religious event where the Peace Torch is taken over water as an offering to Our Lady of Peace. The main square facing the ocean is home to the Statue of the Scuba Diver and the legendary Anchor. Stop and kiss your sweetheart in the Callejón del Beso (Kiss Alley). Pick up a few handicrafts and souvenirs in the local shops. Visit the Monday Market. Enjoy a few balazos de camarón (shrimp shots) at the Buzzos Restaurant. Listen to Live Jazz at the Encore Restaurant. Drink a cold beer at The Drunken Duck. Savor all kinds of seafood dishes at the smorgasbord of beachfront restaurants.